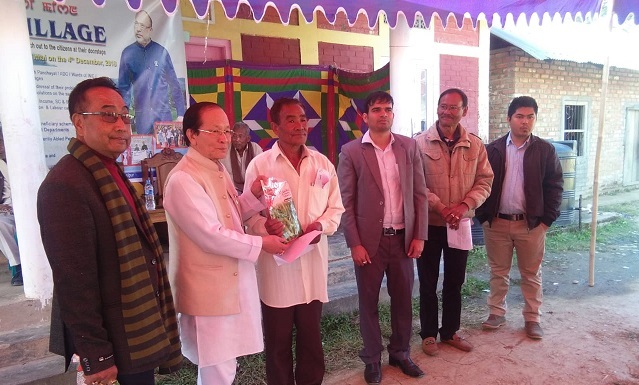 As part of the continued initiatives taken by the Manipur Government, the Bishnupur district administration conducted ‘Go to Village’ (GTV) camp at Ithai Government High School located in Ithai village, about 60 km south of Imphal for all villages under Wangoo Gram Panchayat on Tuesday. Kumbi MLA Sanasam Bira Singh, Deputy Commissioner Pawan Yadav of the district led the district level officers (DLOs) attending the camp where Sub-Divisional Officer (SDO) of Moirang was the in-charge. Disbursement of various Government schemes which include seeds and fish feed distribution, free medical examination and treatment, and on-the-spot water testing to the beneficiaries were delivered, said reports available here. With enormous public support and participation since the launching of the programme on May 1 this year, the district administration has so far covered Bishnupur and Nambol sub-divisions under the GTV Mission. On the other hand, Chandel district administration conducted GTV camp at Challong village in the district under the supervision of SDO, Chandel Ksh Siddharth, who is the nodal officer. In the day’s GTV camp, a total of 9 villages in and around Challong village under Chandel Sub-division, namely Larong Khunou, Larong Khullen, Libung, Darchin, Vomku, Thumtam, Challong and Paraolon were covered. A total of 24 numbers of gas cylinders were distributed by the Indian Oil Corporation, especially for Vomku village beneficiaries apart from delivering various Government schemes. Similarly, there are also reports of holding GTV camps at Mata Lambulane Community Hall for Tuibong SDO/BDO covering 23 villages (Mata Lambulane, H Ponpi, Sabual, Khotuh, Hengkot, H Mongjang, Hopelane, S Kaplane, SalvaLhanbung, Lenglakot, SongpiKholui, Songpi, Monglenjang,Mongneljang, Gangpijang, T Zoujang, Tolphei, Thinghangjang, Telsing Bazar, Molhoi,D Khonom, Vaojang and T Tangnom) all under the Churachandpur district administration on Tuesday, another source said. Ex-chairman of Autonomous District Council Churachandpur, Khaipao Haokip, who was present at the camp lauded the efforts of the Chief Minister’s noble GTV Mission and said that the people of the area are immensely happy as the services are being delivered and easily availed within their vicinity. Dignitaries attending the function included SDO, Tuibong, James Doujapao Haokip and other DLOs. At the camp site, as per official reports, the Medical Department conducted child health screening, diabetes & hyper-tension screening, registration for Chief Ministergi Hakselgi Tengbang, a Government health scheme and also free medicine were distributed at the camp. The Veterinary & Animal Husbandry doctors vaccinated 30 cows and dogs on the spot while the Election Department conducted EVM & VVPAT awareness campaign.